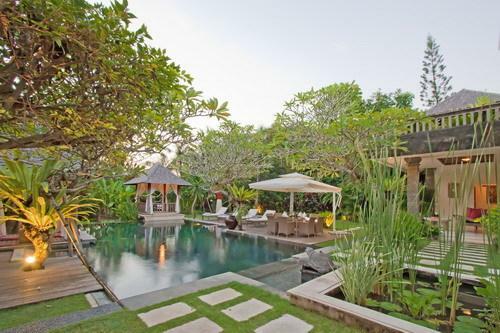 Enveloped within the semi-rural village of Umalas amidst rice terraces and an intricate network of irrigation canals, Villa 3418 is a restful retreat for savvy travelers seeking to unwind in style. 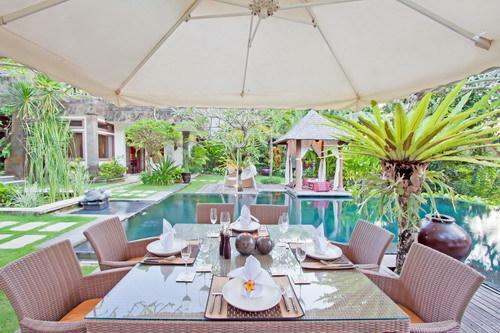 This four bedroom property is just a 10 minute drive from Seminyak, Bali's most happening district filled with chic boutiques, world dining restaurants and chill-out lounges. 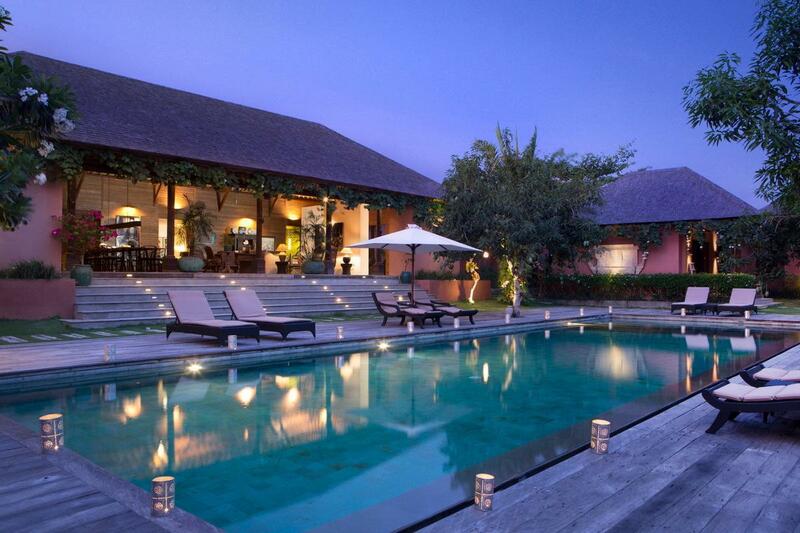 Villa 3418 embraces a prime parcel of landscape with ample parking space for private vehicles. 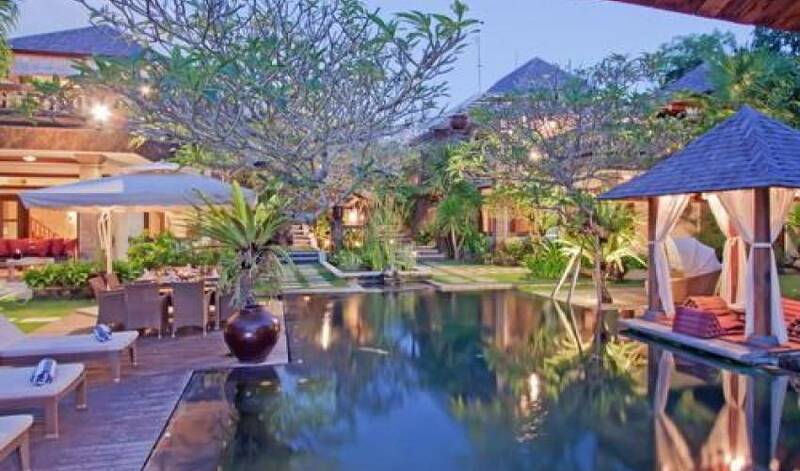 Access by an ornate gateway, the property descends in a series of steps down to a flowing river with a delightful garden featuring a gentle waterway, decorative pond, stone carvings and various species of native flora. 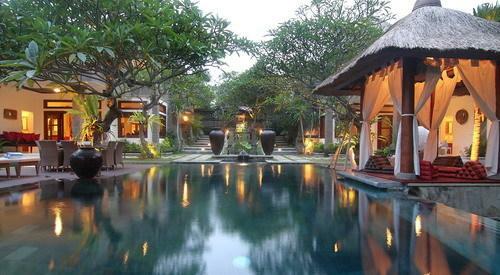 It is a calming environment where the elements of nature soothe the senses. 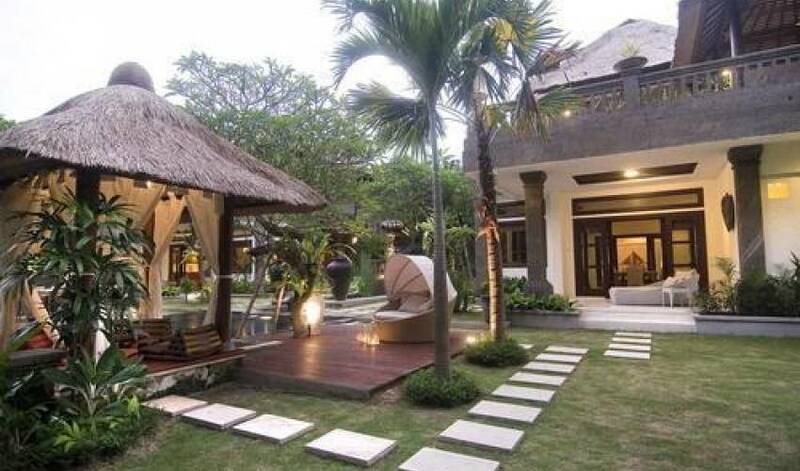 Architecturally the property is split into two distinct structures that are almost identical. Both are two storey dwellings showcasing the aesthetics of local design without compromising home comforts and conveniences. To the left is Villa 1, which is characterised by an open-plan kitchen and an oversized dining table catering to 10 guests in a social situation. 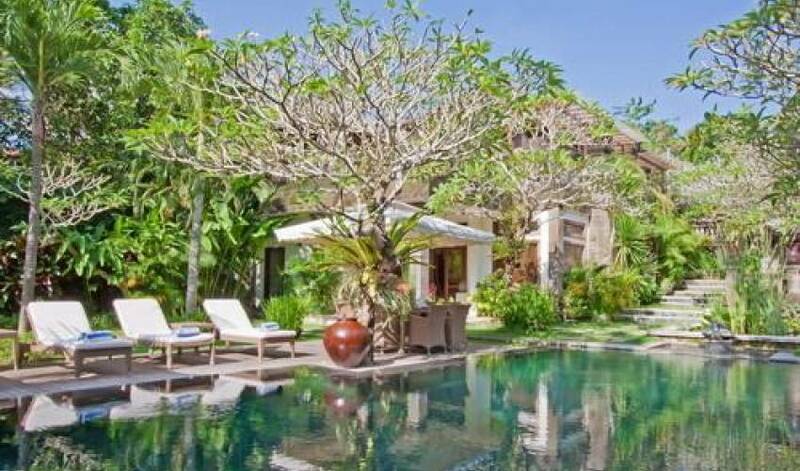 While Villa 2 on the right uses the same area as a tastefully appointed indoor living room with a cushioned sofa to relax quietly alone or with a partner. All indoor and outdoor furnishings have been commissioned by Lio Collection and each building features an IPod dock as well as every other modern facility that guests would expect from a property of this calibre. Villa 3418 has been designed to accommodate up to eight adult guests with plenty of space for everyone to enjoy their own privacy. A master bedroom with an indulging semi-open en-suite bathroom and terrazzo tub is located on the ground floor of each dwelling. 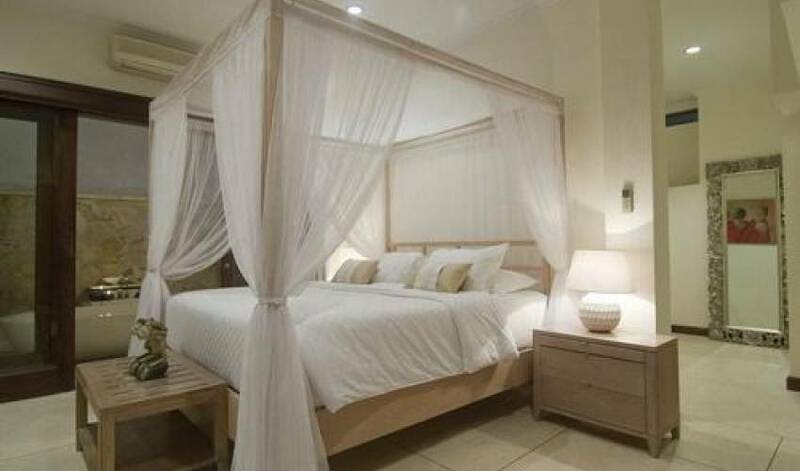 The upstairs of each villa structure also features an additional bedroom suite with its own spa styled bathroom facilities and dressing alcove. 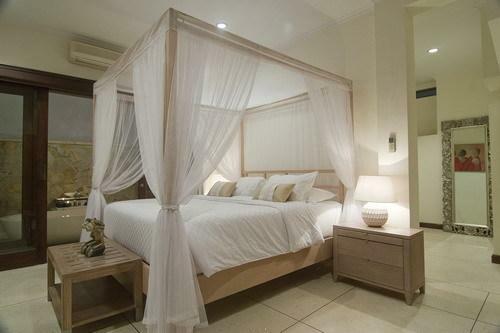 Every bedroom is equipped with satellite television for personal viewing pleasure. 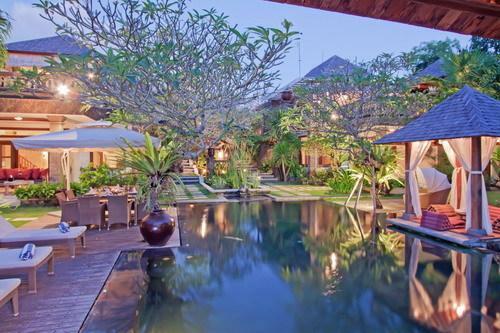 The showpiece of Villa 3418 is a pair of matching rooftop terraces. The open-air edge of each terrace is elevated to take in the tranquil beauty of the garden below and glimpses of rice terraces in the distance. Each has a small table setting for alfresco dining to capture the whisper of afternoon breeze or twinkle of evening starlight. A built-in sofa with a scattering of colourful cushion makes a cozy niche for a lazy midday siesta. While a generous sized cold water Jacuzzi rests beneath a traditionally thatched rooftop to luxuriously soak away the pressures of modern living. Outdoor Pleasures The focal point of the garden is a refreshing infinity edge swimming pool (10m x 6m) encompassed by timber decking and a pair of thatched gazebos proving a shady spot to escape the heat. 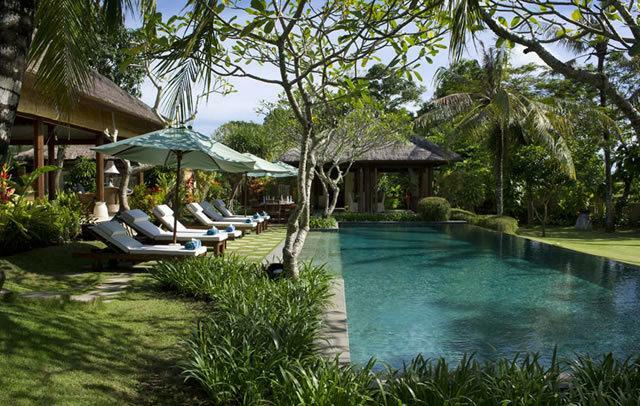 Several reclining loungers are strategically positioned around the pool to embrace the sun's tropical warmth. 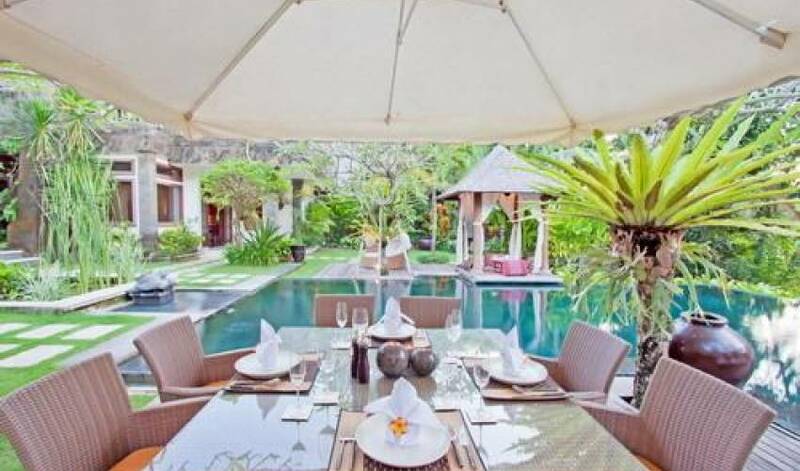 Villa 3418 comes equipped with a BBQ facility and outdoor dining can be set up to cater for up to 8 guests with or without a tented canopy overhead. This entire space lends itself to intimate weddings, birthdays and other small scale social gatherings. 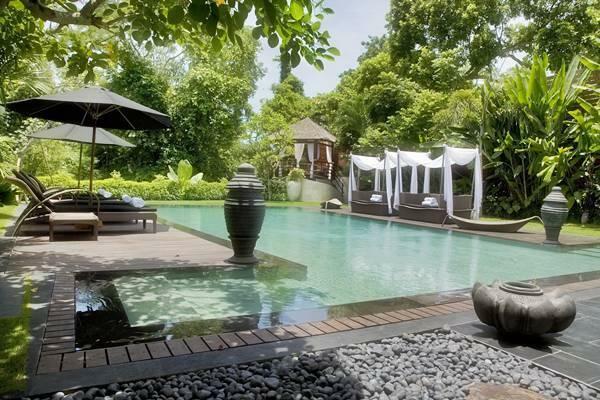 The garden seamlessly blends into the surrounding environment and the sound of water from the river below enhances the overall serenity of this charming setting. 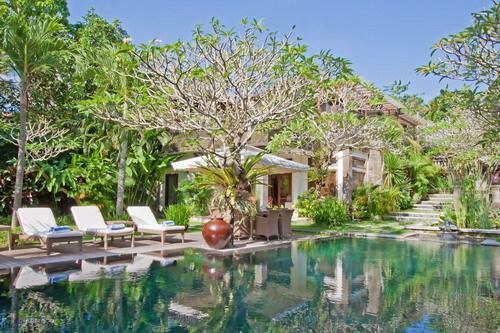 Villa 3418 is fully staffed and efficiently run by a House Manager with support from a Housekeeper, Gardener/Pool Attendant and a Security team to safeguard the property around the clock. A well trained Cook is also available for the preparation of local and international cuisine. A choice of menus is provided and this service is inclusive of all grocery shopping. All food preparation is done in a separate wet kitchen and meals can be served in several spots throughout the property. He will assist you on everything you need. He will make sure guests have a wonderful stay at Estate. Take cares of cleaning the rooms and your personal laundry. They also make sure your beds are turned down in the evening. They will do their best to please you. With the help of the menu please choose what you would like to eat or you may prefer the cooks to decide the menu them self. Please let them know several hours before lunch or dinner - as they will need time to shop and prepare the meal. Their day off is flexible, so please let them know one day in advance when you plan to eat in the restaurant, so they can have one day off each week. Their working hours is 8 am onwards with a break in between meals. 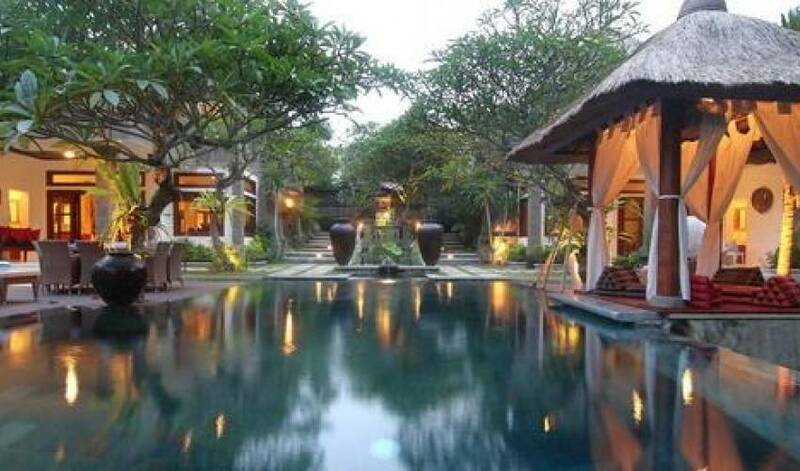 The tropical climate of Bali ensures lush of garden which they keep constantly busy maintaining our grounds. They also takes care of the swimming pool with chemical. 3 Securities These three night guards work from 4pm and stay until 7am.